Home Date Interview Questions Difficult Date Questions How to find number of days between two given dates in Java? Write a program in Java that prints number of days between two given dates. We are using below method of Date class that is present in java.util. * package. public long getTime() -> This method returns the number of milliseconds since January 1, 1970, 00:00:00 GMT represented by this Date object. Then we have to convert Milliseconds to Days. I hope everyone is aware of below conversions. Using this we can easily convert Milliseconds to Days. How to convert String to Date ? * Days. Step by step we are converting. // Converting milliseconds to seconds. // Converting seconds to minutes. // Converting minutes to hours. // Converting hours to days. Output - How to find number of days between two given dates in Java? Note : You can also use this calculator for validating your result. 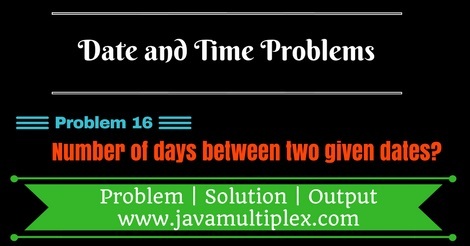 Tags : Date and Time Problems, Days between two dates in Java, Solution in Java, String, DateFormat, SimpleDateFormat, Regular expressions.